This class is parametrized over the type of the input image and the type of the output image. The input is assumed to be a binary image. If the foreground pixels of the input image do not have a value of 1, they are rescaled to 1 internally to simplify the computation. The filter will produce a skeleton of the object. The output background values are 0, and the foreground values are 1. Rafael C. Gonzales and Richard E. Woods. Digital Image Processing. Addison Wesley, 491-494, (1993). To do: Make this filter ND. Definition at line 61 of file itkBinaryThinningImageFilter.h. Definition at line 71 of file itkBinaryThinningImageFilter.h. Definition at line 89 of file itkBinaryThinningImageFilter.h. Definition at line 98 of file itkBinaryThinningImageFilter.h. Definition at line 80 of file itkBinaryThinningImageFilter.h. Definition at line 107 of file itkBinaryThinningImageFilter.h. Definition at line 104 of file itkBinaryThinningImageFilter.h. Pointer Type for the output image. Definition at line 101 of file itkBinaryThinningImageFilter.h. Type for output image: Skelenton of the object. Definition at line 83 of file itkBinaryThinningImageFilter.h. Definition at line 92 of file itkBinaryThinningImageFilter.h. Definition at line 70 of file itkBinaryThinningImageFilter.h. Definition at line 86 of file itkBinaryThinningImageFilter.h. 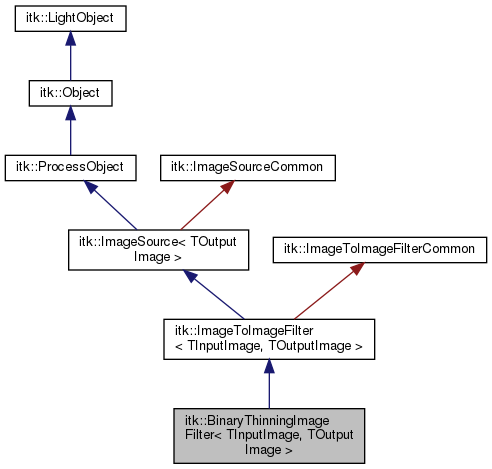 Definition at line 68 of file itkBinaryThinningImageFilter.h. Definition at line 95 of file itkBinaryThinningImageFilter.h. Definition at line 69 of file itkBinaryThinningImageFilter.h. Get Skelenton by thinning image. Definition at line 113 of file itkBinaryThinningImageFilter.h. Definition at line 114 of file itkBinaryThinningImageFilter.h.